THIS ITEM IS NOT AVAILABLE AT PRESENT. WE WILL NOT BE GETTING ANYMORE Star Wars Hot Wheels Starship 2-Pack Wave 2 Case. From the Star Wars Hot Wheels collection by Mattel. 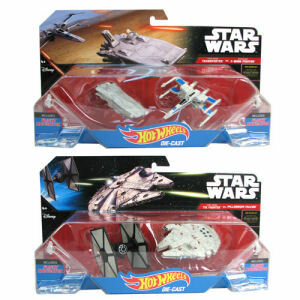 Star Wars Hot Wheels Starship 2-Pack Wave 2 Case. 2 The Force Awakens FIRST ORDER TRANSPORTER VS RESISTANCE X-WING FIGHTER - 2 The Force Awakens FIRST ORDER TIE FIGHTER VS MILLENNIUM FALCON. Vehicles measure up to 3 inches long. Mattel Star Wars Die Cast shipping from Canada. No Surprise Border fees or Customs!